Scarlett Johansson and Sofia Vergara star in Jon Favreau’s newest food-focused film, Chef. Unlike the blockbuster films Favreau has directed recently (Cowboy & Aliens and Iron Man), this is a small budget, independent creation. In addition to directing, Favreau, who broke into the business as an actor before transitioning to other areas, also wrote and stars in this film. Chef is off to a “fruitful” start, as it was well received when it opened the SXSW Film Festival and was an official selection at the Tribeca Film Festival. Favreau stars as Carl Casper, who quits his job at a well-established L.A. restaurant, after feeling too restricted by a limiting menu. Dustin Hoffman plays a controlling boss who doesn’t allow for imaginative input in his food selection. Upon quitting his job, Favreau’s character returns to his hometown of Miami, where he comes to understand a healthier way of reinventing both his love of food and family. Through the establishment of a Cuban food truck with his ex-wife and son, he finds a less traveled pathway to happiness. In addition to Favreau, other stars acting as “key ingredients” include Johansson (Her, The Avengers, The Island, and Lost in Translation) playing the restaurant manager and Favreau’s girlfriend and Vergara (Modern Family) in the role of Favreau’s ex-wife. Like Johansson, Robert Downey Jr. (The Averngers, Iron Man, Tropic Thunder) also worked with Favreau in other Marvel films and will appear acting as Favreau’s encouraging friend. Other stars taking part in Chef include Oliver Platt (X-Men: First Class), Bobby Cannavale (Boardwalk Empire), and Amy Sedaris (Puss in Boots). The trailer (below) showcases chefs cooking and fighting about their struggle to individualize food. 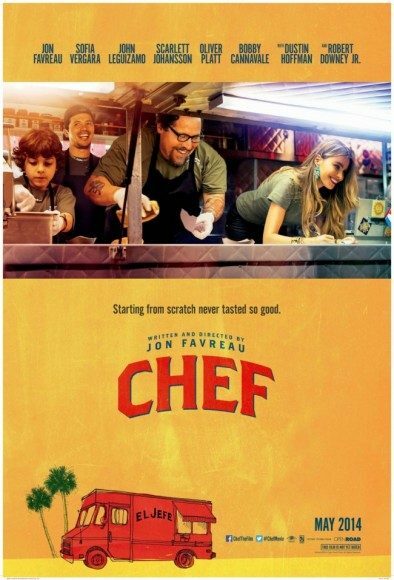 Ex-wife Vergara exclaims, “You are never going to be happy cooking for someone else.” Although Favreau’s flight to take control of the direction of the food he prepares is apparent, there is surprisingly little exposure of Johansson in the trailer. Now that an appetizing trailer of Chef has been released, we are more tempted to have a satisfying experience upon its release. Chef opens May 9th and we hope to see tasty performances.